A selection of media from the MCHS collection, including film, videotape, cassettes, CDs and DVDs. My grandmother did not snore. A former schoolteacher, active member of her church and community, and sophisticated farm wife and mother, snoring did not fit with her idea of who she was. She would have been surprised and perhaps more than a bit shocked to know that two of her grandchildren had surreptitiously recorded her snoring one night in a hotel room in Red Wing, Minnesota. Never used to confront her or make her refute her claim, this bit of documentary evidence has come to be an important piece of family history, a piece that has the ability to conjure up a vast assortment of images, stories, and sounds associated with my grandmother and her life. This priceless treasure faces serious threats to its existence as it was recorded on audiotape, a media format that like many others is subject to deterioration and is unstable over time. Managing and preserving media can be a challenge but, with a few precautions, the natural life of any media and the information it contains can be extended for the benefit of present and future generations. 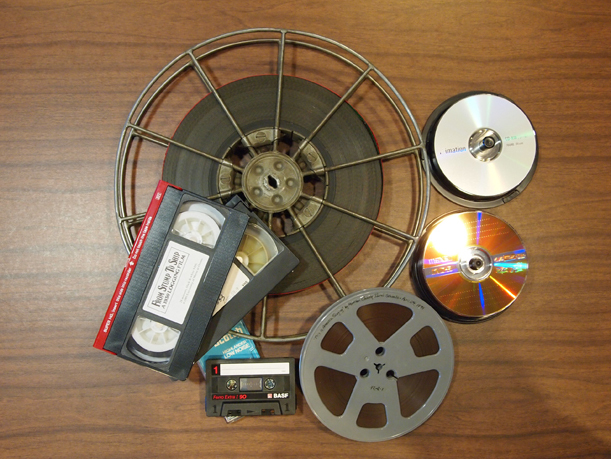 Motion picture film, audiotape and videotape, and optical media such as CDs and DVDs are media formats that are particularly problematic to preserve. Understanding their composition and the threats they face is an important step in managing their survival. Motion picture film, which has gone through numerous variations since it was first introduced in the late nineteenth century, basically consists of a clear plastic base with a thin layer of gelatin emulsion and an image composed of either color dyes or small particles of silver. One of the earliest films was cellulose nitrate film, which was introduced in the early 1880s. Scratch-resistant and durable, this film had excellent visual quality but was subject to decomposition and had the frightening drawback of being highly flammable. Cellulose acetate or “safety film” was introduced about four decades later. While not flammable, it was also subject to decomposition, particularly to acetate film degradation or “vinegar syndrome”. Vinegar syndrome is easily identified by a pungent vinegar smell and can cause warping, shrinkage, and buckling of the gelatin emulsion. Most motion picture film today is polyester base. Introduced in 1955 for non-film or slide applications, polyester base film is not flammable, is dimensionally stable over time, and is extremely strong and resistant to tearing. It too, however, is subject to deterioration. Audiotape and videotape do not have it much better. Magnetic media formats, audiotape and videotape consist of a ferric oxide coating (with the addition of pigments for videotape) in a polymer binder on a paper or plastic support. Audiotape formats include analog, such as the ¼” reel-to-reel tape introduced in the late 1940s; compact cassette, which was introduced in the 1960s and was the format used to record my grandmother “not” snoring; and digital audio tape (DAT), which first appeared in 1987. The first commercially available videotape, a two-inch open reel format called Quadruplex, was introduced in 1956. Videotape did not become widely available to the public until 1975 when Sony introduced the ½-inch videocassette format, Betamax. Audiotape and videotape face a wide variety of risks including loss of recording from demagnetization, mechanical stress from poor air quality and fragility of the tape, and physical damage from mishandling, bad rewinds, and use of poorly maintained equipment. The most vulnerable component of magnetic media is the binder, the layer that is used to adhere the magnetic particles to the support. The binder is often polyester urethane, a cheap and durable plastic that is highly susceptible to moisture damage. This can lead to binder hydrolysis or “sticky shed syndrome”, a form of decay that causes softer than normal binder coatings and gummy residues on the tape surface. Format obsolescence, or the loss of data due to a lack of access (for example, no machine to play the media), is a constant hazard. Some formats are already obsolete. Optical media, such as CDs and DVDs, are also subject to format obsolescence as well as to decay and to the loss of data through other means. Though among the youngest of media formats, they too have a limited lifespan. CDs and DVDs are composed of multiple layers, much like a sandwich. CDs have at least three layers – a polycarbonate support; a reflective layer of aluminum, silver, silver alloy, or gold; and a protective coating. CD-Rs, or recordable CDs, and magneto-optical discs (MO) also have a laser-sensitive layer added to the support. DVDs are a bit more complex as they are constructed of two CDs bonded together with an adhesive. As the stability of the layers is unknown, delamination or separation of the layers can be a problem. Magnetic fields, exposure to light, poor air quality, mold and corrosion are other serious threats. videotape, and motion picture film should be housed in plastic polypropylene cases without paper inserts. Optical media should be stored in jewel cases rather than in plastic sleeves, which can stick to the disc. They can also be stored in the same type of inert plastic containers used for magnetic media and film. With optical media, migration or digitization is the most important preservation tool. Film and magnetic media also benefit from the creation of digital copies as this allows the original to be stored while still permitting access to the contents. Currently, film-to-film duplication is the recommended procedure for archival film preservation as digitization at full film resolution is not yet a viable solution for most. The slow but steady decay of media is an urgent problem. As we move increasingly into a digital world, new questions and problems will arise regarding preservation, format obsolescence, and continued access. While posing a seemingly daunting set of obstacles, if we ignore the preservation needs of media, an irreplaceable legacy will be lost. With a little care, the unique challenges of media preservation can be managed so that present and future generations can learn from them and enjoy. This article originally appeared in the Morrison County Historical Society’s newsletter, Volume 25, Number 4, 2012.